Kaluza G Acquisition Software is works on the Gallios Flow Cytometer and is designed to reduce time at the instrument, saving more time for analysis and exploring data. The interface is organized with graphical cues aligned to the workflow. 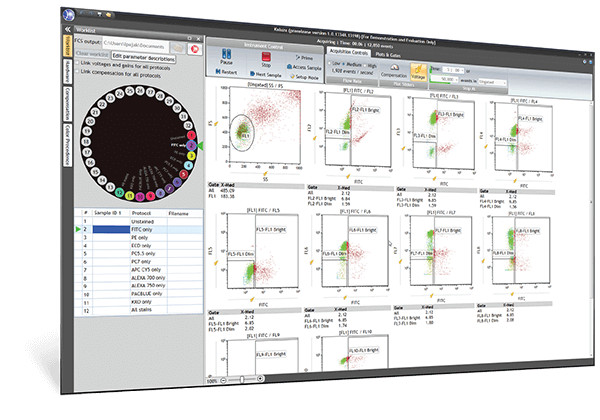 Through the Carousel Display, you can choose Protocols for each sample, make edits to a sample’s attributes, and copy data to the next available sample position. An offline authoring version allows users to set up Protocols and Worklists for acquisition beforehand, saving time at the instrument. The software supports a 25 million event (with 8 parameters) file size and one touch importing into Kaluza Analysis Software. Processing capabilities of the Gallios workstation allows for simultaneous acquisition with Kaluza G and analysis with Kaluza Analysis Software. Operating System Windows®7, 64-bit, with Service Pack 1.